The City of Coventry is celebrating yet another spectacular achievement in its sporting calendar as it is proud to announce securing the Europe Corporate Games. Europe’s largest corporate multi-sports festival will be staged in the city as part of the European City of Sport 2019 programme, with many of the events taking place at the University of Warwick. The city has received a number of high-profile awards with the recent success of securing the UK City of Culture 2021, European City of Sport 2019 and as a Commonwealth Games venue in 2022 showing that Coventry is a leading destination for sport and culture in the UK. Coventry is already a member of the Worldwide Corporate Sport Community following its staging of a very successful UK Corporate Games in 2013. It will showcase the new multi-million Sports and Wellness Hub at the University of Warwick. The Games is expected to generate more than £5million for the local economy and highlights the best that Coventry has to offer. Some of the most powerful businesses in the country have already shown a keen appetite to be part of the event as the city prepares itself to welcome thousands of athletes and over one hundred companies to experience everything that is great about Coventry! 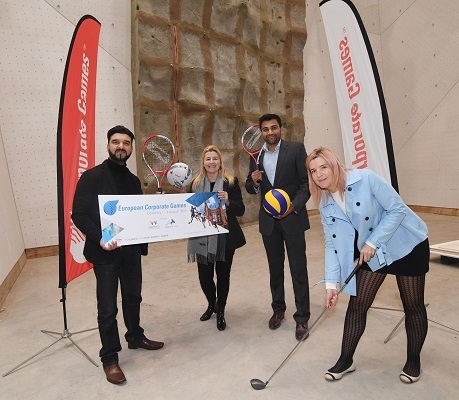 Cllr Kamran Caan, Cabinet Member for Public Health and Sport said, “We have a great and growing track record for hosting major sporting events so we will be delighted to welcome the Europe Corporate Games next year – in August as part of our European City of Sport. “Our year will be about celebrating sport and physical activity at all levels because we know how great the benefits are. From walking the dog to running in a competitive race we will be celebrating the joy of getting moving. The Games will take place 1- 4 August 2019 and there will be 23 sports to choose from. Companies are already entering athletes in their hundreds for next year’s competition. Dr Maureen Johnston, President and Founder of the Worldwide Corporate Sport Community, commented: “The Europe Corporate Games is the region’s largest corporate multi-sports festival. This is an exciting time for all as we are celebrating 30 years of the Games on a worldwide platform. Teams from all over the UK and Europe will travel to Coventry to sample everything that this historic city has to offer. The new world class Sports and Wellness Hub will give athletes the chance to play a range of competitive sports from Badminton to Basketball, Netball to Softball. The Games will also include some more adventurous sports such as Dragon Boat Racing, Open Water Swimming and Karting. Golf will be a featured sport as will three classes of Football, -11s, 6s and 5-a-side. There really is a sport for everyone. Athletes compete for Medals and Corporate Awards, whilst also enjoying the buzz and atmosphere of the city and the beautiful Warwickshire countryside. University of Warwick Vice-Chancellor Professor Stuart Croft said “We are delighted that University of Warwick has been chosen as a key venue to host the Europe Corporate Games for 2019 and especially as we will be able to host this fantastic event in our new Sports and Wellness Hub which will be one of the finest centres of its kind in the UK. Businesses and institutions across Coventry and Warwickshire, will be challenged by multinational and ‘household-name’ organisations from the UK and Europe. However, the Games isn’t just for the huge and mighty of the world’s corporations, it welcomes even the smallest business, group or club to participate and become winners. A team can be made up of one person or more than a thousand! Keep up to date with CWLEP news and upcoming events by subscribing to our newsletter. Do you have an emerging project that will grow the local economy? Find out how CWLEP can support your project. CWLEP is an alliance of private and public sector organisations working towards a shared purpose: to grow the local economy, attract new investment, and increase prosperity.